I certainly needed that message today. I have been in a funk this week and am having some trouble getting out of it. I won’t go into the details here; it’s not necessary. When I feel like this and decide to do something uplifting instead of huff and pout my way through the day, one thing always happens: the world drops some knowledge on me, loud and clear. Since it was nice and sunny outside after work, I decided to sit and write on my porch, a setting I enjoy but do not make time for very often. I pulled my camp chair out of storage, grabbed a notepad, and filled a giant goblet with cold water, sitting it beside me on the cement. I had been listening to a song on the radio on my way home earlier, and it came into my mind as I stared at the blank page. Then, I started to write. The words came easier than I expected, but there are always natural pauses in my work. I fidget, or look up when someone walks by. I get hypnotized by the honeybee pollinating my poppies. I imagine something crawling on my toes and feel the need to whip them up in the air and shake them around a little…you know, just in case. really take a look, and breathe. love, loyalty, wisdom, and truth. Wake up and hear your crow-cry! Don’t fill your head with toxic waste. with the one who loves you best? I just want to know you’re filled with hope. Know the world is here to help. I got curious. 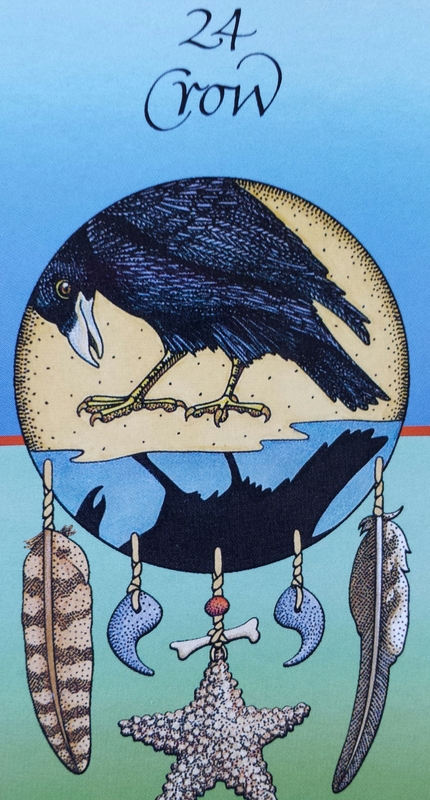 I have these Native American animal medicine cards, and I thought, if Crow is giving me such a strong message, I owe it to myself to get that book out and reread what crow medicine is all about. Instead of copying and pasting the entire page (however, please click the link to experience it in its entirety), I will attempt to paraphrase. The Crow sees that all worlds are an illusion, and that there is something much greater the laws of humanity. When we think of the Crow, we tend to think of death. This is just one of the infinite worlds. Because Crow is a shape-shifter (some see this as the metamorphosis between the living world and the dark unknown of death), it is illustrating that change is always imminent. Nothing is what it seems, but the Crow is the one who is able to peer through the clouds to ascertain what is truly important. Those who feel a connection with the Crow should use this knowledge as their guide. balance past, present, and future in the now. Shape shift that old reality and become your future self. Allow the bending of physical laws to aid in creating the shape shifted world of peace. Boom. That spoke to me, big time. All the bad feelings I’ve been having this week were shattered by that paragraph. I felt refreshed and different when I read it. I love that words—and words alone—can do that for me. They bring up something inside that just needs the tiniest bit of prodding to come out. Have you read, heard, or watched something that made you feel this way? If you want to, borrow Crow today and see what it brings out in you. ← Who are you? Speak your truth! You are so amazing. I know those words seem so simple – and they do as they exit my fingers and land right here…but they are the truth. You have a light, a wisdom, your laughter echos through the emptiest chambers of ones heart! Thank you for sharing your light with me.